When it comes to islands worth visiting in Southeast Asia, few can compete with the allure of Bali; however, if you’re expecting a Utopian pristine paradise, as often is depicted in the movies and popular culture, you’ll be in for a rude awakening. Bali is what it is – unicorns and warts alike. Although there is stunning scenery, world class beaches and enchanting Hindu temples to explore there is also eyesore rubbish piles, filthy beaches and unscrupulous touts to contend with. If you can visit Bali with realistic expectations it certainly offers up a wide spread of activities and attractions worth visiting. To unwind after a long day of exploring relax at the Rock Bar Bali. After spending nearly a year travelling in Southeast Asia, we couldn’t leave without first visiting Bali. We decided to take a 2 week trip to the famed island and split our time between Ubud and Sanur to explore as much as possible. During one of our first nights on the island, we attended a Balinese fire and trance performance. This dance and music drama originated in the 1930s, depicting stories from Hindu literature. Ubud is the art and cultural capital of Bali and we enjoyed spending a few days here. Our mornings in the town were spent visiting the various temples, browsing through markets, and soaking in the surroundings. We also had a chance to visit the Tegalalang Rice Terraces. They were lush, green, and reminded us of our time in Korea because Sam’s apartment overlooked rice terraces. 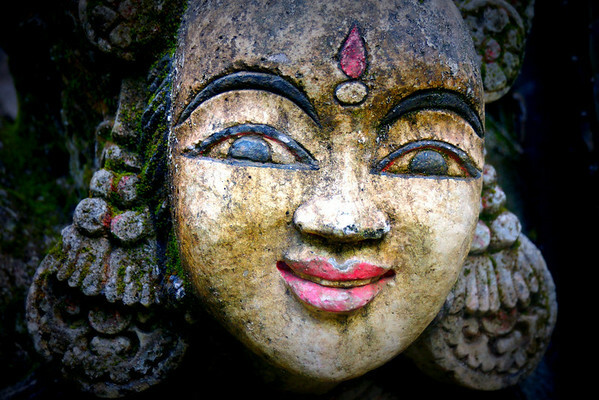 Bali is mainly Hindu and the island is home to many temples. 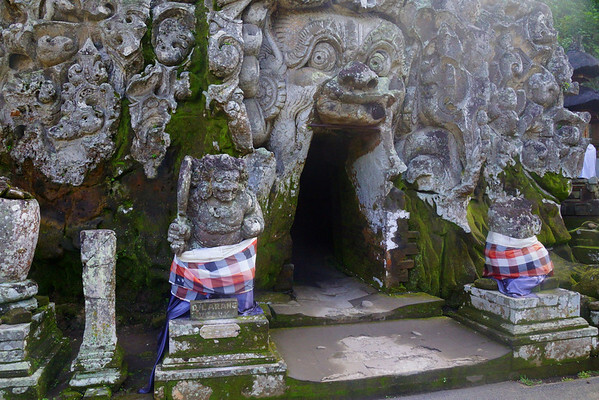 During our time in Bali we visited the Elephant Temple, which is best known for its menacing cave entrance. We also visited Gunung Kawi, which is nicknamed the Rock Temple. The rock temple gets its name because of the 10 shrines that were carved into the rock wall and stand 7 meters tall. They are truly a sight to behold. Well, I am supposed to sprinkle water on my head, so here we go. During our tour around the island, we stopped at a lookout point where we saw the impressive Mount Batur looming in the horizon. Mount Batur is an active volcano, however, when we learned that it was open to hikers, we decided we were up for the challenge. Bali is a great jump off point for exploring some of the surrounding beaches and islands. 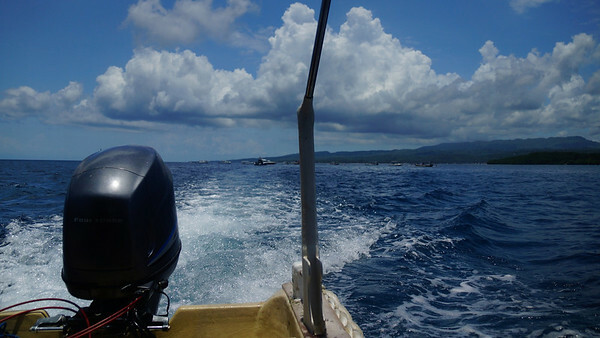 Trips to Lombok, Nusa Lembongan, and the Gili Islands are very easy to arrange. There are plenty of water sports to choose from including snorkeling, free diving, scuba diving, surfing and even kayaking. 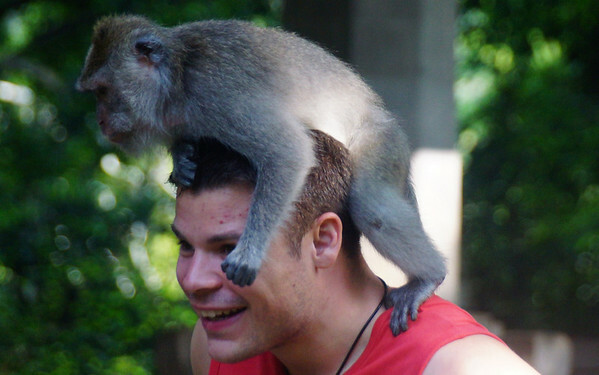 Ubud is home to the monkey forest where infamous little macaques roam freely. The monkey forest is home to over 600 monkeys, who over time have lost all fear of man. The monkeys are not shy and will approach people and even climb onto their bodies if they believe you have food. If you’re feeling adventurous and would like to feed the monkeys, you can purchase bananas right at the entrance of the monkey forest. One of the highlights of our time in Bali, was climbing Mount Batur for sunrise. The morning of the hike, we got up at 2 in the morning and were driven to the base of the volcano. Armed with a trusty guide and flashlights in hand, we began the steep climb that would take close to 2 hours to complete. We took plenty of breaks along the way, but once we finally reached the top, we were rewarded with a rainbow colored sunrise. Overall, we really enjoyed our time in Bali! It may not have been the quiet paradise that’s depicted in the movies, but it offered culture, natural beauty, and it was a great place to relax. Yoga at the Yogabarn in Ubud is a wonderful way to find utopia! i’m considering bali for my next holidays in september, hope it is the right period :)) thanks for the tips! That’s cool! It should be a lot of fun for you if you do decide to go. Love Bali, it’s been so long since we’ve been there I really want to go back. we’re considering Asia for the winter next year, we may have to make a detour to see how much it has changed. Deb, that sounds like a great plan. It is more crowded than the first time I visited back in 2008; however, I had a better time this time around staying in nicer places in Ubud and Sanur as opposed to Kuta beach. I’ve been thinking about going to Bali in the next year or so – this post is really convincing me! Looks fabulous and so varied and culturally rich. nice pictures… Who has never been in Bali cannot imagine its beauty. Wow, your photos are amazing. I’ve been to bali a few times and while I know it’s pretty touristy, I still love it. It’s got such a good vibe, especially in Ubud. A part of me aches every time I leave. I picked up the same vibe as you in Ubud. I wish I would have had a few more days there. Woohoo! Thanks for the lovely video. I head to bali in the fall, and I can’t wait! Thanks Susan! Best wishes with your trip in the fall! That’s great to hear about your healing experience and thanks for sharing your article with us. Great list of things to do in Bali! I have been there before but I loved it so much that I plan to return again later this year! There is a couple of things introduced in your video that I didn’t do during my last trip that I have added to my ‘things to do’ list!! BTW, love watching your videos in youtube! I am sitting in the departure lounge in Kuala Lumpur leaving for Bail in 45 minutes! I am even more excited now. Bali is very cultural place. Nice! There are entertainments too and adventures to try. Love it! Thanks Marie! Lots of adventure to be had – that is for sure. A timely post! We’ll be in Bali in October (end of September) and we have a couple of weeks to burn. We’re staying in Kuta for the first few days, then Ubud for the next handful, but then we haven’t booked anything else. We were thinking we could book the rest of our nights when we get to know Bali a bit more. Sarah, that’s a great idea. At that point in time you should have a better idea of what you’d like to do with the remaining time you have in Bali. That’s great! It’s the kind of place I’d revisit (it would be my third time). This is interesting timing as I have been reflecting on my time in Bali also. A lot of people think it’s just like Eat, Pray, Love or that it is a peaceful, serene, spiritual paradise. But in actuality it is highly diverse, so although those lovely aspects of it are definitely there, there’s a lot of negative things also. We didn’t like it at first, because we got off to a rough start, but in hindsight I see that all the things we disliked were not really Bali’s fault at all. So next time we’ll have a much better attitude, and as you said – it is what it is – so we will accept it, warts and all. Wow, Bali is so entertaining and fun! I didn’t know that besides being beautiful, it has so many cultural things going on. Glad to hear another good report about Bali, even if it’s not the idyllic place it used to be. I keep hearing not-so-great stories from friends who have visited recently, but it also sounds like if you don’t expect it to be this remote paradise that’s completely isolated, you won’t be as disappointed. There’s an endless list of things to do in Bali! I spent my last trip there visiting the secluded beaches away from the tourist areas. I even found one beach where it was just us there — took hours to find! If you want quiet beaches, head to Uluwatu and skip the Kuta-Jimbaran areas. That’s so cool! We didn’t get a chance to explore in the north but I’ve heard it isn’t nearly as developed. Great video! Really loved it!! Bali is one of my favorite places and you’ve covered it pretty well. My suggestion would be to rent a scooter and drive around the island. We loved Pemuteran in the NW. Great idea! That is definitely something we could have done. Every one of these activities look amazing! The monkey forest temple looks pretty neat! Thanks for sharing! Hope we don’t encounter the “warts” on our upcoming Bali visit… (We’ll be sure to try and avoid thos :-). I agree with your suggestions for sure. 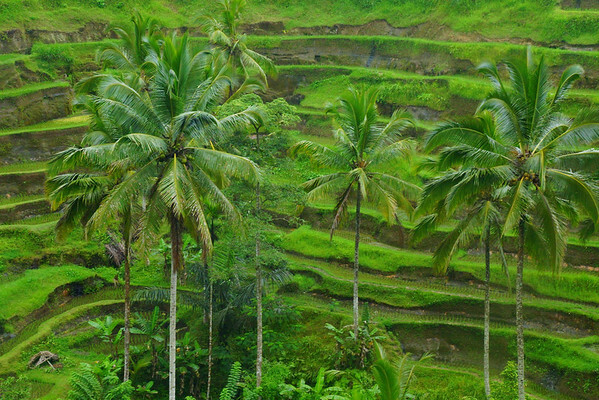 Ubud was a highlight of our trip – the city offers such an amazing chance to see so much culture right there. We went to the fire dances, a shadow puppet performance and another traditional dance at the main square’s stage. No where else (at least that we went) offered such well presented opportunities to experience those types of cultural performances. So, yes there is a lot more of Bali, but we always recommend travelers to spend at least a few days in Ubud and see as much as you can. Great post. Thanks! Samuel, I love Bali! In saying that, though, we kept away from Kuta Beach…prefer the back pastures and Ubud is just gorgeous. I love the Bali laid back and friendly attitude. That’s great Corrine! I definitely prefer Ubud over Kuta. I first visited Bali back in 2008 staying in Kuta and my experience staying in Ubud and Sanur this time around left me with a more positive impression of the island. You’ve pretty much covered what to do 🙂 We’ve visited Bali a couple of times, and I definitely recommend island hopping to Lombok (some liken it to Bali 20 years ago – it’s more relaxed, less ‘hey boss’ and great for adventure with Mt Rinjani) & the Gili Islands, Air, Meno & Trawangan (especially if you like diving/snorkelling/chilling out). One thing I suggest doing is visiting a ‘traditional’ balinese home – extended family resides within an array of buildings enclosed in a boundary wall – cooking, sleeping, worship defined quarters etc. Quite fascinating. Hiring a mountain bike is also a great way to explore, particularly through the rice fields – you might come across a school and the kids go beserk when they see a foreigner! Very cute. Bali is a small island, but offers so much and it’s a perfect place to recharge the batteries as well. Great suggestions Anna! I think visiting those islands would be a welcome relief from the supersaturation of tourists in most sections of Bali. Hi! I’ve been following you for a long time now. I recently saw your photos of Istanbul, where I am now, loving it!! Got pics. Of kitties too. I live in Jakarta and am at airport waiting for the return flight. Maybe someday we’ll cross paths, fun& T.Y. What camera and lens do you use to take the pics during your travels? Thanks. Can you tell me a little about the food in Bali? Obviously you really had a great vacation in Bali. Hiking up Mount Batur (an active volcano) for a spectacular sunrise viewing is perfectly one thing to do! Thanks Marie! It certainly was a great experience and one of the best sunrises I’ve ever seen! It’s worth looking beyond Bali and visiting more remote an unspoilt areas of Indonesia such as Flores. I agree with you Christina. We most mostly just chilled out by the pool and/or beach. It’s a great place to go when you’re tired from your travels and just want to chill out for a bit. 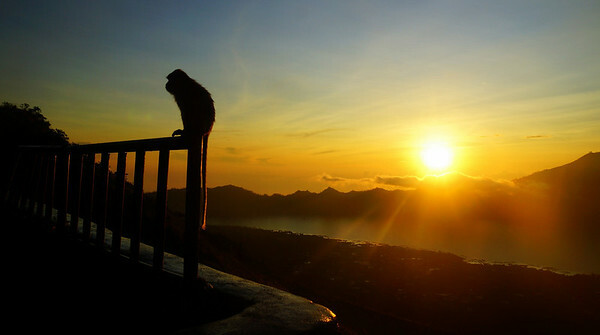 Just LOVED that Mount Batur sunrise shot with the macaque … excellent video as always guys! Thanks James! We were sure lucky to get good weather that morning as it was raining the night before. Oh but it can be quiet and unspoilt. Shame you didn’t leave Ubud and the south behind and head to the central highlands and west Bali national park.